The headlines are full of a variety of disasters, from storms to tragic events. However, not all reps will follow the news or have the same awareness of events affecting different parts of the country. 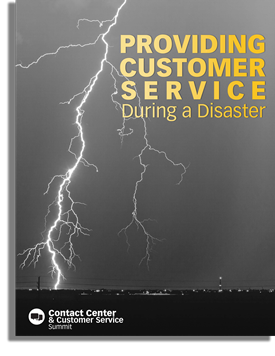 Here's how to help your customer service team provide top-notch support to disaster-affected customers. Are you prepared to take on 2018's top customer service challenges? The Contact Center & Customer Service Summit, taking place November 12-13 in Austin, is here to help. And, great news--your registration is complimentary! Your VIP invite includes executive hotel accommodations, meals and refreshments, and event workshops. Along with this download, you will recieve a complimentary subscription to Marketing Daily Advisor, a daily e-newsletter of original and curated content.